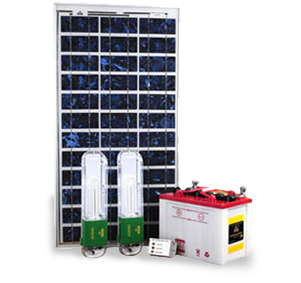 The Solar home lighting system essentially consists of the Solar module, suitable module mounting structure, battery, battery box, charge-controller, luminaries, inter-connecting cables and switches etc. All light assemblies have built-in high efficiency and high frequency DC to AC inverter circuits for suitable to run CFL lamps. Ideal for remote villages where the availability of conventional electricity is either not available or unreliable. Can provide power to any AC load. Compatible with conventional power supply. Maximum Power Point Tracking System for optimum use of power available. The Stand Alone Power Plants can be connected to the conventional grid in case of electrification of the village by conventional method. Option of charging through Grid/Genset. Silent and non-polluting source of electricity.